Home Crepe Blog Ever Wondered if Gelato and Ice Cream Are the Same? Let’s find out! Ever Wondered if Gelato and Ice Cream Are the Same? Let’s find out! One of life’s simple pleasures is settling down with a bowl of rich, creamy dessert. Gelato is everything that a good dessert should be. With a dozen or more flavours of gelato at Crepe Delicious, you can make dessert a meal! Combine your choice of gelato with one of our sweet temptation crepes. Gelato is often confused with ice cream as both are frozen desserts created out of dairy ingredients. What is the difference between the two? Is Gelato just the Italian Word for Ice Cream? The Italian word gelati, means ‘frozen’ and that is the origin of the word gelato. Gelato obviously has different characteristics from ice cream that give it the dreamy soft texture and melt-in-the mouth richness of milk compared to an ice cream’s richer, creamier composition. Gelato contains milk, water, and sugar, along with fruit and nut purees and flavourings. Although the fat content is lower, the sugar proportion is slightly higher than other styles of ice cream. Ice cream is cream and water based, and as water freezes, it forms hard, crunchy ice crystals. The expertise in ice cream making is the technique of adding ingredients to minimize this crystallization. Fat: Gelato has less fat than ice cream. While ice cream is made with heavy cream, and at times egg yolk is used to give it a custard-like effect, gelato is milk-based. Sugar: Gelato has higher sugar content than ice cream, and the sugar and water combination acts like anti-freeze which prevents the gelato from freezing solid. Air: This is infused into ice cream during the churning process. Fluffy ice-cream with a less dense texture indicates the amount of air in it. Gelato lacks the fluffiness as the churning process is slow, with minimal air infused in the mixture. Storage temperature plays a crucial role in the making of ice cream and gelato. Colder storage means harder ice cream, while warmer storage ensures a soft, looser texture. The temperature at which these two frozen desserts are served is different. Ice cream is best served at about minus 12 degrees Celsius while gelato is served warmer than ice cream. Ice creams are churned at a higher speed than gelato, thereby increasing in volume with air infused in the process. This makes them fluffy. On the other hand, to avoid air getting into the mixture, gelato is churned at a considerably slower pace, keeping the texture dense and the flavour much more intense. Therefore, the joy of relishing mouthfuls of gelato makes the experience more pleasurable! At Crepe Delicious, you can enjoy one or more of the exciting flavours of gelato straight out of our perfect temperature-controlled freezers at any of our locations. Come in for your favourite crepes and don’t leave without delectable gelato for dessert. Planning an event? Make an impact with our range of lip-smacking flavors at your next party with our catering services. 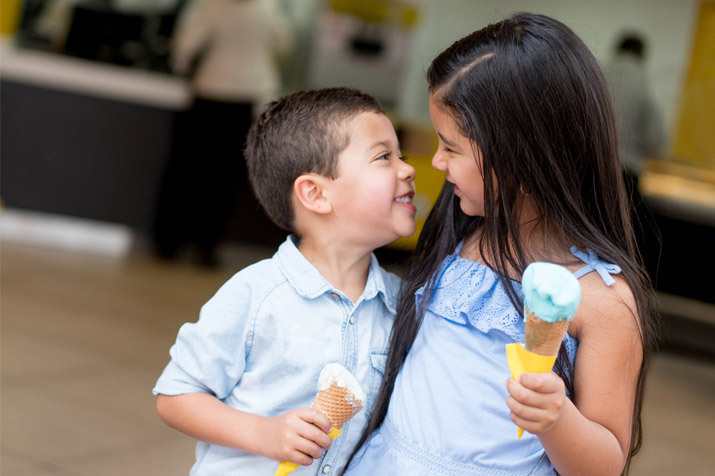 We are sure you will not be able to resist reaching out for an extra scoop! Find a location near you to try your favourite gelato today.